Trip leaders: Paul Lehman, Guy McCaskie, Gary Nunn, Matt Sadowski , and others. 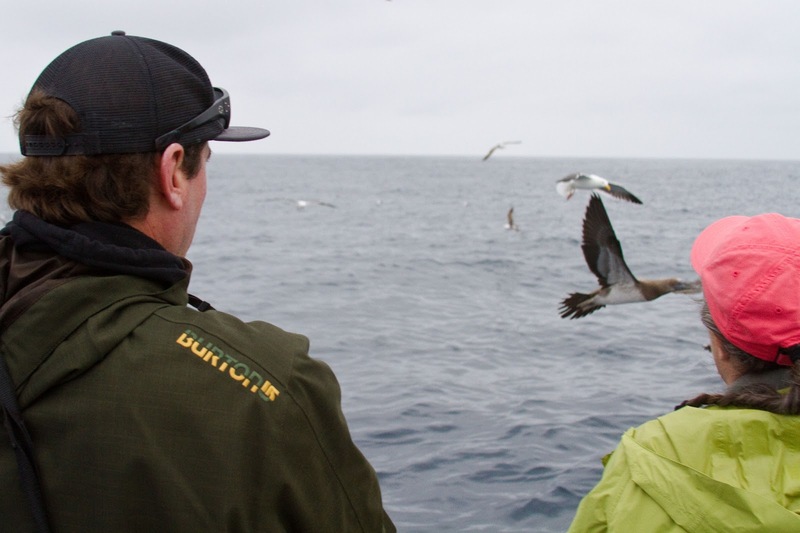 After forty-five eager sea birders boarded the roomy Grande at Point Loma Sportfishing Landing, Paul gave a boat and sea birding orientation prior to departure, ending with a caveat that this trip was early in the migration so numbers and species might not be what we'd expect later on. He also noted that the ocean often serves up surprises at any season. To quote a good friend, we had a "Blank Canvas" with no way of knowing what might be painted on it by the end of the trip. True, how true! At 7:00 a.m., the Grande was underway with owner James McDaniels at the captain’s wheel. Our first stop was at the bait docks for the usual California Sea Lions, pelicans, cormorants, long legged waders, and gulls. We also got a look at a lone Black Turnstone. Heading down the channel we picked up a mix of Common Loons nicely decked out in breeding plumage; Elegant and Royal Terns; Brant; Surf Scoters; Peregrine Falcon; Osprey, and others. We also had a small pod of Inshore Bottlenose Dolphin in the channel near Shelter Island. Once offshore we immediately noticed a big movement of loons. Clearly this was a major event. Most were Pacific Loons, with a sprinkling of Red-throated Loons. 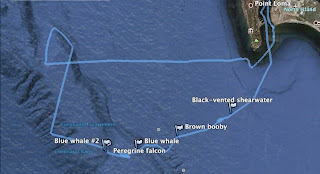 Although we saw 4000-plus loons throughout the day, the vast majority were within the first 3 miles of Point Loma, where we spent the least amount of time. Once or twice the ocean seemed to have a seemingly crawling effect from the masses of moving birds. 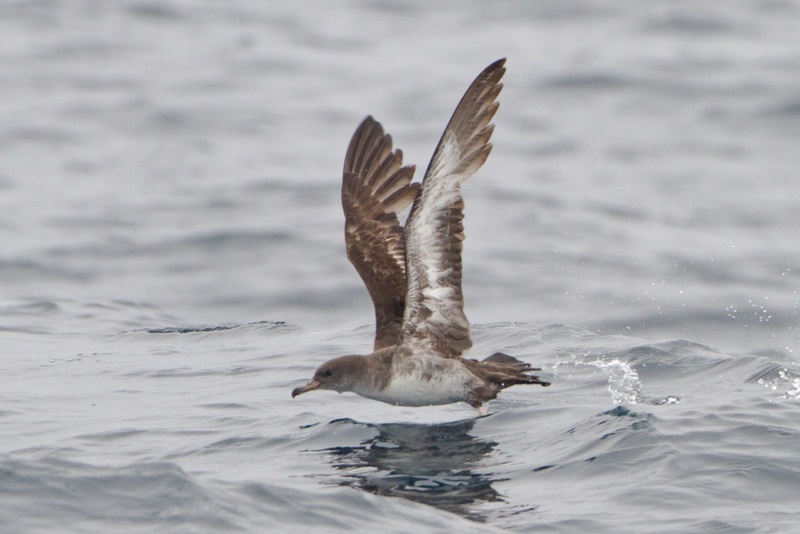 We picked up three Black-vented Shearwaters in their normal inshore zone, even though most have returned to their breeding islands along the central Baja coast. 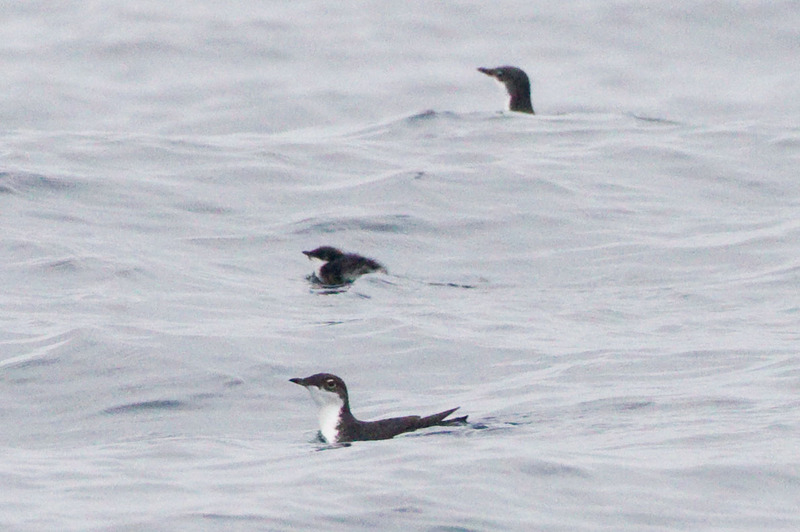 The next surprise was a pair Scripps's Murrelets, a newly-split species from the "old" Xantus's Murrelet. The pair itself was not the surprise; in fact, the trip was billed as the best chance for seeing them given it was peak season for their breeding on the local Coronado Islands and we saw about 45 for the day. The surprise was this pair had newly-minted downy chick tucked safely between them, at the earlier end of calendar dates for chicks at sea. We did have another trio (adults w/chick?) seen at a distance near the end of the day. Scripps's chicks go to sea with one or both parents around 48 hours after hatching, and start swimming to the northwest away from their home island. Since the chick is unable to fly, these adult/chick combos give the best close-in looks at this species. The ocean wasn't done with surprises; our next was a boat-length flyover by an immature male Brown Booby. This bird aimed to please with multiple passes, once coming in so close I saw birders duck to avoid its kamikaze-like approach to the stern. Lots of photos taken as folks ran from one side of the boat to the other. Just inside the Nine Mile Bank we spotted a number of whale spouts. 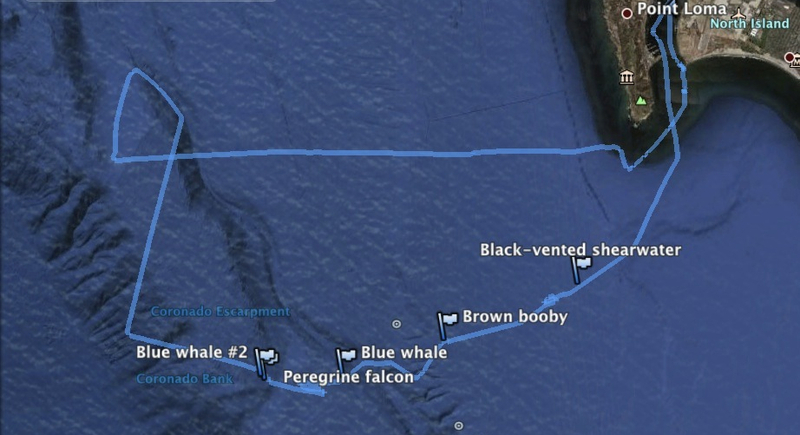 I believe our total was one, two or three Fin Whales; a Minke Whale; and two Blue Whales, with the last one coming right by the bow, giving us a close-up look at this massive animal and its impressive-sounding exhale/inhale. While looking at this whale, we had the only Rhinoceros Auklets (2) of the day plus a pod of Offshore Bottlenose Dolphin. All in all, one of those great moments when everyone was excited at what to look at next, and next, and so on! Our trip to this point had also produced a Pink-footed Shearwater, a few Sooty Shearwater, a Northern Fulmar or two, some distant low-flying Least Terns, a scattering of Scripps's Murrelets, Cassin's Auklets, more Bottlenose Dolphin, and a pod of Common Dolphin, as well as any number of California Sea Lions and a lone Harbor Seal. We had a constant stream of small numbers of loons, a couple of flights of Surf Scoters, one flock of 150 Brant, a high flyby of a Peregrine Falcon (8.8 nautical miles from shore), a group of dowitcher-sized shorebirds, an "Audubon's" Yellow-rumped Warbler and at least one Rufous Hummingbird added to the mix. Driving up the Bank, things got quiet but we picked up our first distant Black Storm-Petrels, a couple more Pink-footed Shearwaters and another Northern Fulmar that stayed with us for most of the rest of the trip. 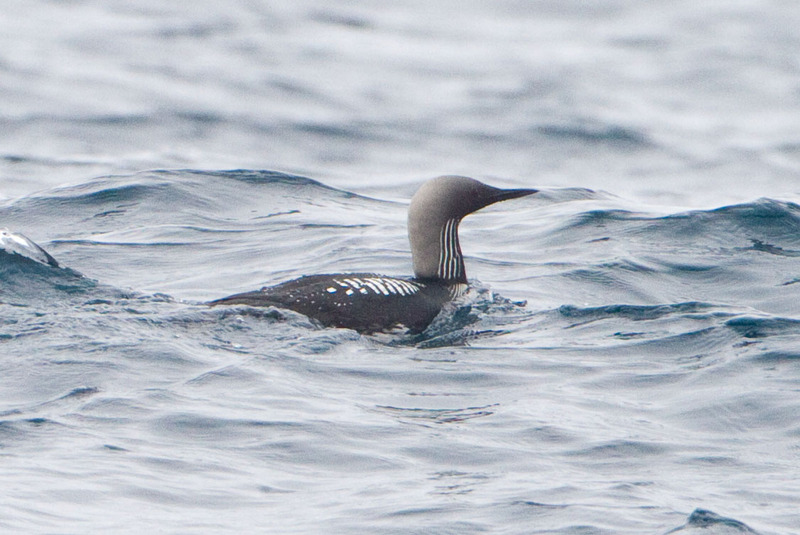 On the return home, we found many loons, a close-in Pink-footed Shearwater, several Sooty Shearwaters sitting on the water just a mile or two off the kelp line, and our only Common Murre of the day flew over us there. A quick check of Zuniga Jetty turned up a nice mix of rocky shoreline birds, with a Wandering Tattler, Surfbirds, and many Black Turnstones. The base of the jetty had a large group of cormorants, pelicans, as well as Elegant, Caspian, and Royal Terns. As we pulled away, a shout caused us to turn the boat back around to look for a well-hidden immature Brown Booby among the cormorants. Although some speculated that this bird may be the same immature specimen seen early in the day, photos proved it to be a different bird. Well, not bad…not bad at all! Hey Terry, we filled our (your) canvas up today!